VHC Plumbing and Heating employs a highly talented bathroom design and installation team, whose members are all fully certified, insured and Gas SAFE registered. We operate a bespoke bathroom fitter London service that lets you take control of your bathroom – offering excellent prices on high quality designer units from around the world. Take advantage of our exclusive bathroom fitter London service to have your existing bathroom remodelled: or to enjoy the luxury and retreat of a brand new, purpose built bathroom. Our bathroom fitters London can redesign your existing bathroom to make better use of its space, or to bring its fixtures and fittings up to date: or we can go all out and help you create your dream bathroom right here in your existing home. Our bathroom installer London service can also offer you a full range of shower room, en suite, secondary bathroom and walk in wet room designs. 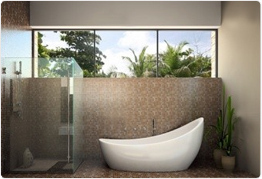 Just ask the bathroom design and installation team for details – or call us to request a free quote, on 078 3363 5445. Whether you are looking to change your existing bathroom, or too have a new bathroom created from scratch in a room that has never been plumbed before, VHC Plumbing and Heating’s bathroom fitters London team is your ideal provider. Call us on 078 3363 5445 for a no obligations quote and we’ll help you make the bathroom of your dreams.